The overall turnout of the Egyptian voters in the initial two days of presidential election 2014 reached only 7.5 percent of the total number of people listed in the electoral rolls, according to The Egyptian Center for Media and Public Opinion Studies, known as Takamol Masr. The low turnout was especially evidenced by what some would consider a desperate move by the High Elections Commission, deciding on Tuesday to extend the presidential voting one more day. 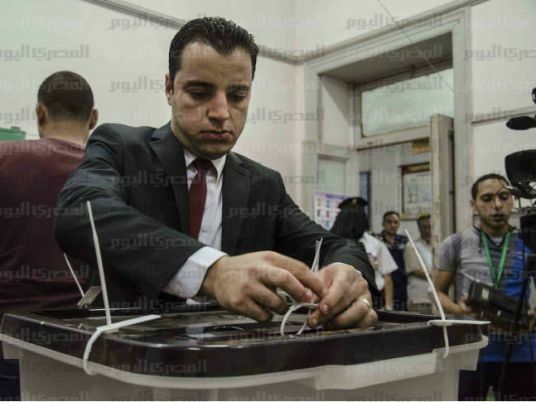 Takamol Masr released a report disclosing that almost 4,004,000 Egyptians cast their votes during the first two days of the elections 26 and 27 May 2014. The center estimated the number of participants in the presidential election in 2014 with the help of 53 researchers and 297 volunteers. These numbers contrast with the statement from General Hani Abdul Latif, spokesperson for the Interior Ministry, who told the privately owned MBC Misr that the turnout indices have reached around 30 to 35 percent of the enrolled electoral rolls in the first couple of days. The center reporter that the largest turnout of voters was in Qena governorate by 10.5 percent, and the lowest was in Marsa Matrouh with 1.2 percent. While the percentage of voters in the biggest two cities Cairo and Alexandria were 9.8 percent and 6.7 percent respectively. Speaking to Dream Channel, Deputy Director of the Ahram Center for Political and Strategic Studies, Said Wahid Abdel Meguid, said that there are three categories of people who have decided to boycott the elections. The first is a small group which is represented by the Muslim Brotherhood and their supporters. The second broad category is those who have lost faith in politics as a whole, because they found that things are moving backward not forward. The last category are the youth aged from 15-30 years old who foiled when the MB rule won the 2012 first democratic elections and their frustration exacerbated after 30 June when they felt that a large part of them had been classified as "enemies of the state".